It's 11 a.m. Monday morning, and Dustin Orlando is standing inside his new gallery space on Levee Street. It's a raw, open space that he and his business partner and wife, Gina, are transforming into Circuit 12 Contemporary. For the past three years, their gallery space boasted a Dragon Street address, although it technically sat on Howell Street. As of last month, they've been renting a new space on Levee Street, just down the block from Luminarte and. in the other direction, recent transplants Holly Johnson Gallery and Cris Worley Fine Arts. Levee Street is one of a few areas that have seen a small influx of galleries in the past few months. The Public Trust and Liliana Bloch Gallery recently relocated from Deep Ellum, breezing past Dragon Street to join the once disparate Galleri Urbane on Monitor Street, a block away from the barbecue joint Slow Bone. 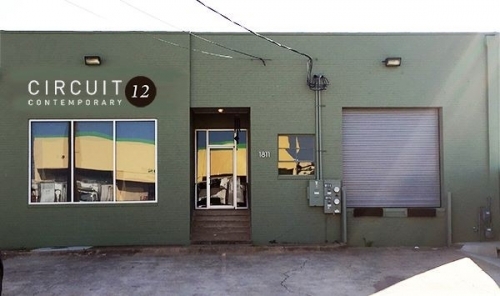 Last year, Erin Cluley Gallery opened in Trinity Groves. And Hanh Ho opened Cydonia Gallery on Payne Street, which boasts neighbors like Texas Ale Project, and where, later this year, Joan Davidow plans to open a non-profit art space. Three years ago, gallerists clamored for space on Dragon Street. It was touted by the real estate companies as the epicenter of the "Design District." With semi-regular events like gallery walks organized on and around the street, business owners were promised foot traffic and a steady stream of interest from designers and their clients. For owners of art galleries, this cross pollination was sure to be beneficial, and there was an intention – a curation, if you will – in the types of businesses signing leases. But the past six months have seen galleries changing spaces, striking up new alliances, and constructing new neighborhoods. And galleries interested in challenging their collectors and visitors aren't renting on Dragon Street anymore. This is not to say longtime tenants of the street will be moving anytime soon. Craighead Green, Christopher Martin Gallery, and others appear to be doing just fine. But ask a critic or an artist which galleries they still hit up on the street, and their answer is likely to be singular: Zhulong Gallery. It's not really a question of who slayed the dragon, because it's a pretty simple problem. As neighborhoods become more attractive to passion-driven businesses like bakeries, bookshops or, in this case, art galleries, other, less culturally relevant businesses will want in the action. In this case, a quick jaunt down Dragon Street today will reveal lingerie shops, speciality clothiers, and event spaces. It was once a sure bet that you could park just about anywhere on Dragon Street and see a gallery in every other storefront. Now, this idea that any semblance of business will be derived from foot traffic due to the street's reputation as an art mecca is dying. Certainly, the non-artsy businesses have been staples of the street for years, but with Circuit 12 recently trading in the coveted address, like Cohn Drennan Contemporary and Red Arrow Contemporary before it, there is change on the horizon. Orlando and his counterparts are quick to disabuse the idea that this change has anything to do with money. He says that the space he's renting on Levee Street is actually more expensive per square foot than the space on Dragon Street, although his new landlord agreed to friendlier terms. Instead, he says, he never saw the return on investment necessary to overlook to the street's pitfalls, not the least of which is a shaky future, limited storefront selection, and a hopeless lack of parking. It's worth nothing that in all of this location swapping, no gallery has moved to the "Dallas arts district," which I propose we stop capitalizing and start using quotation marks for, as it should be properly named the Big Venue District Presented by Verizon, or something. Wouldn't it be fabulous to see an array of galleries built where the cars guzzle gas waiting for valet parking at One Arts Plaza? The Design District, though, has proven its allure, enticing galleries to make the trek westward from their former east Dallas locations. But it's spreading. How will talk about the different gallery pockets now? How will they market a "gallery walk" or "gallery day"? Perhaps they will hire golf carts or pedi cabs to transport people from place to place? "We'll have to invest time and money into making sure Circuit 12 is the destination when before we could rely on some idea of the neighborhood bringing curious visitors there," Orlando says. The move off Dragon Street has drawn new, more serious eyes to the Orlandos, Cris Worley, Holly Johnson, Lilana Bloch, and Brian Gibb's Public Trust. Now, it will all about the art, instead of the neighborhood. Which means the Dallas gallery scene is going to step up its game to keep people coming through the door.